Instead of school we go to the hill. Lie flat on our backs, grass tickling my neck, tickling the backs of my bare legs. Above us the un-tangible drift free, forever shifting temporal shapes. A fluffy white bunny cloud gets longer, stretches out and breaks into road kill. The imagined wisps of a cliff fall into coastal erosion against a perpetual sky. 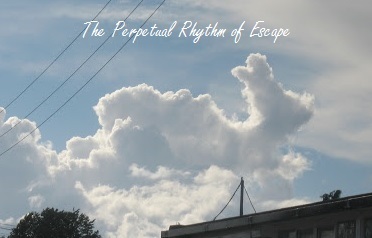 The Perpetual Rhythm of Escape is story of the week on Ladybox book’s Ladyblog!